What is the difference between cable-lock (pop-up) tables, and locking-pin tables? What is the difference between static weight and working weight? What are the covering options? How long does it take to get my massage table? Can I upgrade my Robert Hunter massage table? How much does it cost to ship a table? 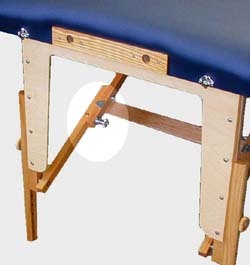 Cable-lock brace systems are the most commonly used design of portable massage tables today. They are used especially by massage schools where the 'pop-up' feature is important. The reason massage schools favor the cable-lock pop-up tables is because their tables are set up and down so often, by students who are unfamiliar with the workings of massage tables. How does the cable-lock system work, and why don't we use it? The cables that support the two sides of the folding table are used to keep the braces in the open position, so when the table is set up, there is no need to secure the braces. It's done automatically. The students don't need to worry about the details of setting up the tables. Sounds great right? So why don't we make them anymore? Why have we gone to the trouble and expense to design and have manufactured custom hardware for the purpose of an alternative brace locking system? Simply because our focus is on the long term professional use of our tables. We would rather build QUALITY tables that last a long long time, designed for the professional setting than to build tables for the massage school market. Why don't we think that cable-lock tables last as long? In our experience with cable-lock massage tables, we have found that as long as there is stationary weight on the table, everything is fine. But the problem is; the movement of the weight on the table is transferred through the brace system, wearing out the pivot points. In time the table is loose, squeaky and swaying back and forth as the therapist applies pressure. Our solution to this long-term problem was to design and fabricate a better more secure brace locking system. It takes about half a minute longer to set up, but is well worth it in the long run. Our tables have proven themselves over and over again as truly long lasting therapeutic tools, favored by professionals. Static weight is the amount of weight the table will hold without any movement of the table. Place a 3000 lb. truck on a massage table, but do not touch -- just look. Gently push the truck -- watch it and the massage table topple over. Working weight is determined by the weight of the client and takes into account movement of the massage table. Movement is defined by the pushing down and sideways, pulling and rocking motion encountered during a massage session. We offer oil and stain resistant vinyls, our standard vinyl, and Dura Touch�. Both are available in a number of colors. Both are cold resistant to zero degrees Fahrenheit. You can special order a number of colors. Our vinyl's do not "out gas" (release obnoxious fumes) like the vinyl used in the automobile industry. We will build your table within two weeks provided we are not backlogged. Call for our current production schedule. Shipping time is one to ten days depending on the carrier. As your style changes, you may upgrade your table so that you never get stuck with an obsolete massage table, even with our Outcall table. We are a direct sales manufacturer. We prefer to pass on volume savings directly to the purchaser rather than pay commissions to re-sellers. One way we do this is to offer a group discount arrangement. Businesses buying multiple tables as well as groups of students can take advantage of our group rates. Call us about our group discount rates.